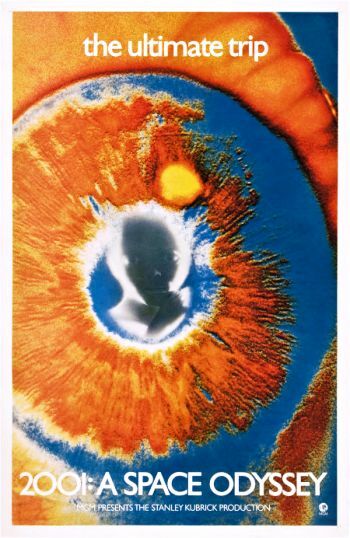 Gut reaction to Stanley Kubirick’s “2001: A Space Odyssey” – WHAT THE HECK WAS THAT?!? Honestly, how did they discuss this movie in the 1960s? Without the Internet to bounce ideas and theories off each other, did people just accept the fact that they couldn’t understand it since they didn’t have access to the geniuses who post things on the Web? I can’t even fathom how dinner conversations might have gone in discussing such an innovative movie. I can definitely feel a sense of overarching purpose in both the works of Nolan and Kubrick. The former, however, is much more forward while the latter is more subtle, really requiring us to trust in his directorial abilities. In 2010, a time where Kubrick has been given God-like status among filmmakers, it’s very easy to do that. But in 1968, I can imagine I might have been a little more skeptical. The movie is packed with all sorts of themes, imagism, motifs, and symbols, many of which I have absolutely no idea how to interpret. And I’m not even going to try (to quote “A Serious Man” despite the fact that I despise it, “accept the mystery”). On the surface, the most accessible thematic element is that of artificial intelligence. We build computers to be smart, even machines like the HAL-9000 that can supposedly make no errors, but when will come the time that they become smarter than us? This idea has definitely been echoed quite a bit ever since, often times in a more paranoid tone (see “The Matrix”). There’s also the ground-breaking special effects, which wow me even in 2010. Crowd reaction must have been like “Avatar” on steroids. The fact that someone can watch visual effects over four decades old and not be able to laugh at them is practically unfathomable, yet here is “2001” with spectacles that are barely even dusty. And beyond the graphics, the movie also boasts some very appealing cinematography and skilled make-up artistry. And of course, no discussion of “2001” can be complete without discussing the music. I swear that “Requiem” was used in “Inglourious Basterds” when the Nazis killed Shoshana’s family, but I can’t confirm it anywhere (and thus risk looking like a fool if I am refuted). But the eccentric, or as some would say, innovative, sequences where the only thing we is hear is instrumental music are definitely incredibly influential. Not to mention the incredibly eclectic nature of the film’s music, which often times feeling entirely out of place, that I say for sure manifests itself in today’s movies. Look no further than Quentin Tarantino for that. I’m not ready to crown Kubrick’s “2001: A Space Odyssey” one of my favorite movies of all time, although I know many would include in their pantheon of fantastic films. However, I am thankful that this movie was made because it got the ball rolling for the future masters of science-fiction and fantasy to further expand the possibilities for the genre. I think it’s a topic to debate whether this still reigns supreme or if any of the movies it has inspired have eclipsed it. *NOTE: I wrote this entire review without consulting any source that would attempt to explain the mystery that is the movie to me. That has to count for something. Interesting… I was definitely thinking of this film during the zero-gravity grapple of “Inception.” Good to know I wasn’t entirely off base. I was in two minds about 2001. Could appreciate it for the advances in technology, special effects, landscapes, use of real physics in space. On the other hand, a 25 minute unnecessary prologue with apes?! I think the best (and only) way to view this would be on drugs, plenty sweet sweet drugs. I’m sorry but I just don’t get this movie. I ended up drifting in and out of out the room because I was bored and it seemed to make very little difference to the overall effect of the movie. It came across as self-indulgent and just plain weird. It’s like the modern art of the movie world. It’s not a film as we know it (it doesn’t have a plot for starters) so people will argue for decades about its realative merits. For me, this one just isn’t worth the time. I wasn’t a big fan. It was so surreal that I just had no idea what to make of it. Yeah, what was Kubrick thinking? He should have tried to design a movie that is easy to digest when the viewer is walking in and out of the room! It’s just a lucky thing for him audiences in 1968 were forced to sit through the whole movie without the ability to text their babysitter. Otherwise we wouldn’t still be talking about this movie. As my English teacher says, “Art is supposed to make you walk out of the theater saying WTF, make you sit down and discuss until you have made sense of the entire thing.” I’m against making anything digestible just for the sake of being digestible. You’re lucky. The original cut was three hours long. At the risk of being brutish, I would call the prologue with the apes anything but unnecessary. It is about man’s dominance over the world that we live in. The whole point of the film is that we go from primitive gathering to the farthest reaches of the galaxy, and Bowman becomes God himself. Great movie! !Although most will criticize this for being so ambiguous, its actually quite understandable. People just have to give this one more of a try, and they’ll understand it all.